Chives are an herb native to the temperate and northern parts of Europe, Siberia, and North America. It has a long history of use in the kitchen, with some recipes from China going back at least 5,000 years. Rumanian Gypsies used chives as part of their fortune telling rituals, and when dried bunches of chives were hung in the house it was believed to drive away disease and evil influences. 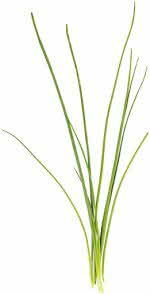 A hardy, fast growing herb in the lily family, chives are cultivated for their long slender leaves. They are used in salad dressings, herb butters and vinegars, soups, stews, etc. The flowers are also edible. Chives are believed to strengthen nails and teeth, and have antibiotic properties. It is said that chives are an appetite stimulant, relieve high blood pressure, and are a natural insect repellent. Chives inhibit mildew, and are used in feed for turkey hatchlings.